The bleached bones of hundreds, perhaps thousands, of nameless PNG wartime carriers lie where they fell in unknown locations in swamps, jungles and formidable mountain ranges during the New Guinea campaigns. To this day we don’t know who they were. We don’t know where they came from. We don’t know where they died. There is no record of their existence. No medals were ever struck to acknowledge their service towards the war effort. It’s time to honour their sacrifice by providing a Spirit Haus for their souls and a day to commemorate their sacrifice. For those who command a desk in distant bureaucratic and academic institutions the care of a Papuan in a remote jungle is something they will never comprehend. For those who have been carried to safety on a stretcher over inhospitable terrain the unconditional care of their stretcher bearers will never be forgotten. On the other hand Papua and New Guinea wartime carriers were indentured, often at gunpoint, to support a war they didn’t understand. They were never recorded on a Roll of Honour; never issued with a uniform; and never enjoyed the esprit de corps of belonging to a unit. They were essentially nameless labourers. They were poorly equipped, underfed, often overloaded and paid less than a subsistence wage. The spirit of their commitment was captured in a poem by one of their patients who owed his life to their care – Sapper Bert Beros. Many of them now lie in unmarked places alongside jungle tracks far from their village homes. They have no grave. They have no spiritual home. This can be rectified by the PNG Government proclaiming a special day to commemorate their service and sacrifice – Kokoda Day and by creating a spiritual resting place for their souls in the form of a ‘Spirit Haus’ – the PNG equivalent of a Cenotaph which is a Greek term for an ‘Empty Tomb’ – at, or adjacent to, Bomana War Cemetery. 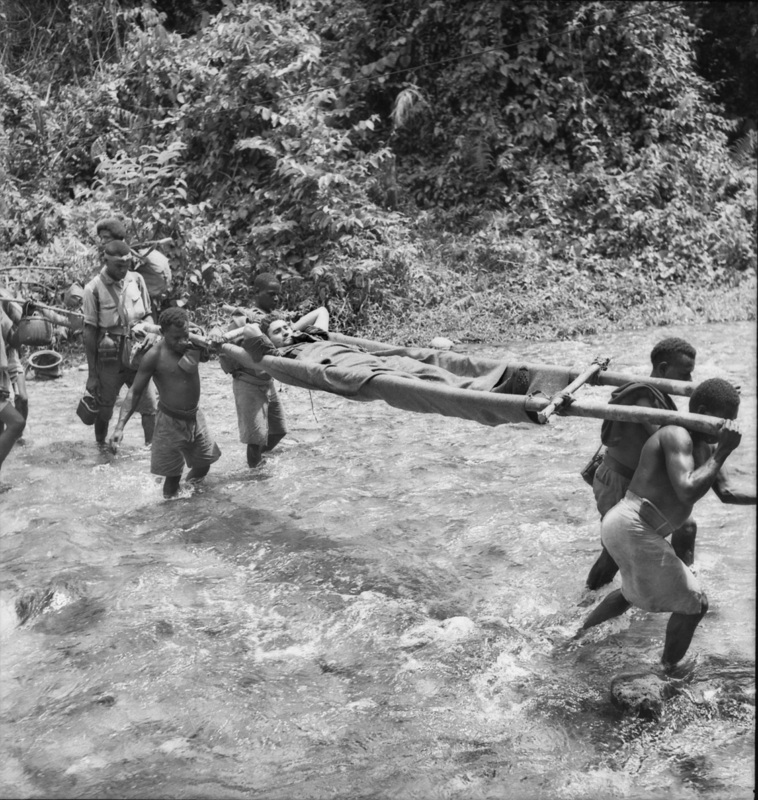 Whilst Remembrance Day in PNG commemorates the service of Papua New Guinean soldiers who saw active service during the Pacific War and the Bougainville crisis, Kokoda Day would be dedicated to the service of the wartime carriers who were never issued with a uniform; who never received a medal; and whose names are not even recorded on a National Roll of Honour. a service at a the Spirit Haus[iv] in Port Moresby[v]. The term ‘Kokoda’ now has a resonance equal to ‘Anzac’ in marketing terms. The fact that more than 45 000 Australians have trekked across the trail over the past decade is testimony to this fact. 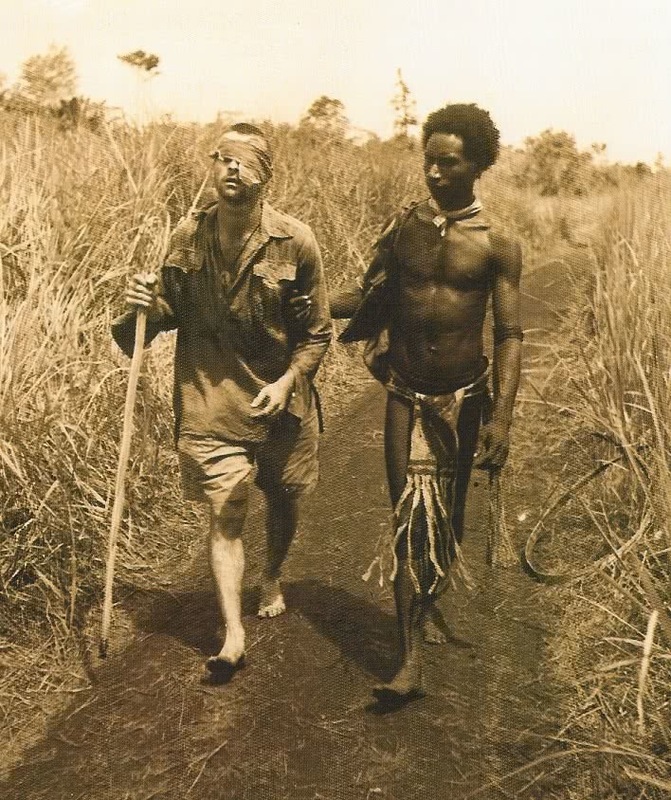 There are many thousands more who would make a pilgrimage to Kokoda without having to trek because of their age and/or physical condition. All they need is the opportunity to plan and commit to it. Their wartime carriers were never honoured in a similar way. They had no units, no uniforms, no battle honour, no ‘Roll of Honour’ no repatriation and they have no spiritual home. Many lie in unmarked jungle graves in provinces far beyond their traditional village homes. Young Papua New Guineans are becoming more conscious and increasingly proud of their wartime heritage. Thought should therefore be given to the creation of a traditional cenotaph or ‘Spirit Haus’ at Bomana War Cemetery adjacent to the spirits of those they tried to save. A ‘Spirit Haus‘ guarded by custodians in traditional dress would become the most visited place in Port Moresby. 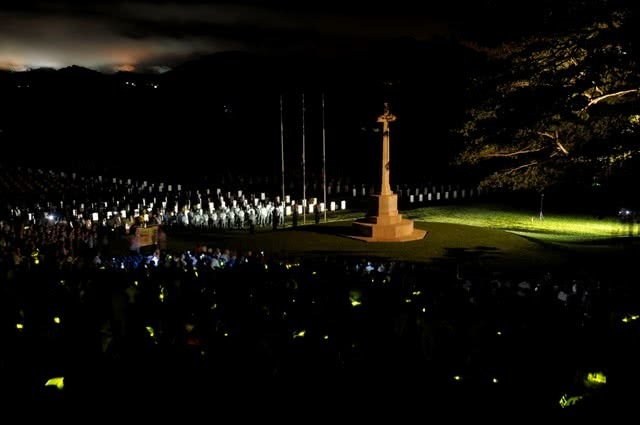 Each Anzac Day PNG students would carry stretchers out of the pre-dawn darkness from the vicinity of the ‘Spirit Haus’ to the sound of traditional kundu drums and walk slowly past the graves of the diggers they tried to save towards the Cross of Sacrifice. They would then lower their stretchers to the ground, turn inwards, bow their heads and remain in that position for the duration of the service. 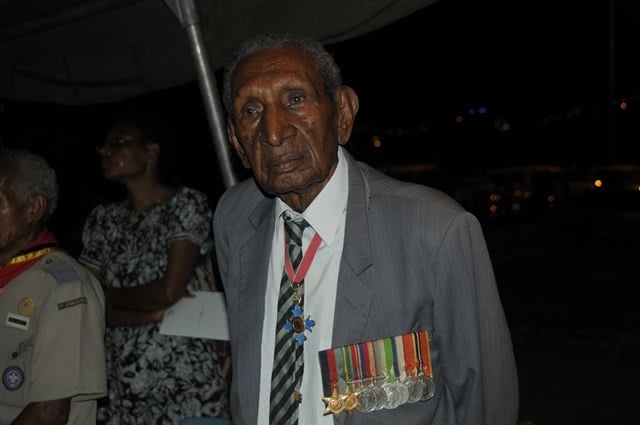 The service of the wartime carriers and the sacrifices they made towards the allied victories in Papua New Guinea should now be honoured and enshrined in a special day dedicated to their memory. For this to happen the PNG National Executive Council has to proclaim the 3rd November as ‘Kokoda Day’ – but first it must receive a proposal from a PNG leader or group of leaders – nothing will happen until then. 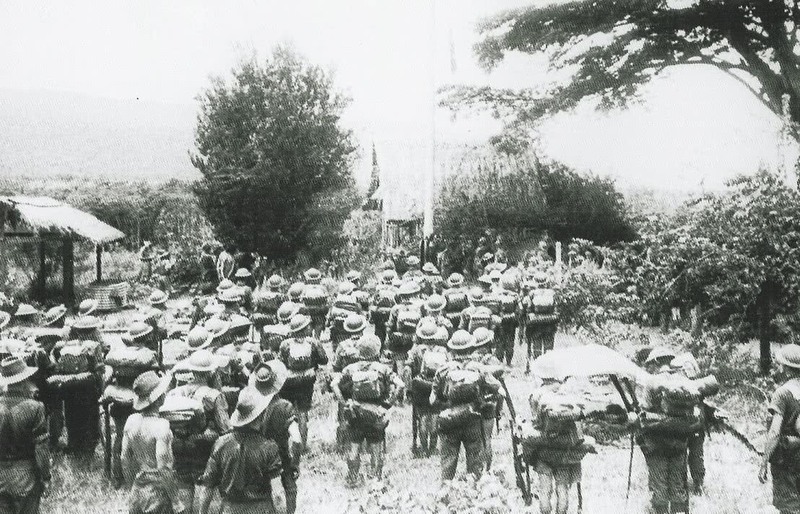 The Australian Flag raised on the Kokoda Plateau on 3rd November 1942 after it had been recaptured from the Japanese.